← The all knowing eye…. Tattletale, tattletale…..hang your britches on a nail! It was by far the worst day of my existence. 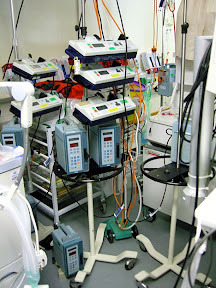 The trauma of what was happening to my son as I watched him lay in that ICU Unit, wasting away to nothing was surreal. Wires and tubes. People came and went. Doctor upon doctor came and went. I stayed. Night and day, I stayed. Couldn’t leave. Didn’t want to miss one moment of opportunity to pray solidly, and in real time as things were happening so, so fast. Still, although its been more than 4 years since his collapse, I cry as I write this. Tears of remembrance. Tears of joy and thanksgiving of what God has done, and where He’s brought us. All I could do is run fast and hard to my Father and His Word. His “peace which exceeds anything we can understand” was so tangible to me. He won’t live….he can’t do missionary work…..he can’t serve people in missions and homeless shelters…..he can’t go to college…..we’ll send him home for a while so you can spend time with him for now. God met those words with….but you don’t know my Jesus! MY JESUS guarded my heart and mind against those words and I went to see what my Daddy had to say about that! He said….yes he will live….. yes he will go to college…..yes he will do missionary work….he will go where I send him and when I send him….He’s MY boy and I give him strength (Phil 4:13). I just became a tattletale and ran to Daddy, telling him all the lies they were trying to say about our boy. Dear one, don’t you believe the world and what they tell you. You run tattle-telling to your Daddy about what’s going on. Tell Him your angst, your worries, your dread….let Him hang your worries on the nails of the cross! He’s big and mighty……He can handle it! Yes ma'am! Ha ha. Tattle on the enemy's lies and watch God answer with truth.